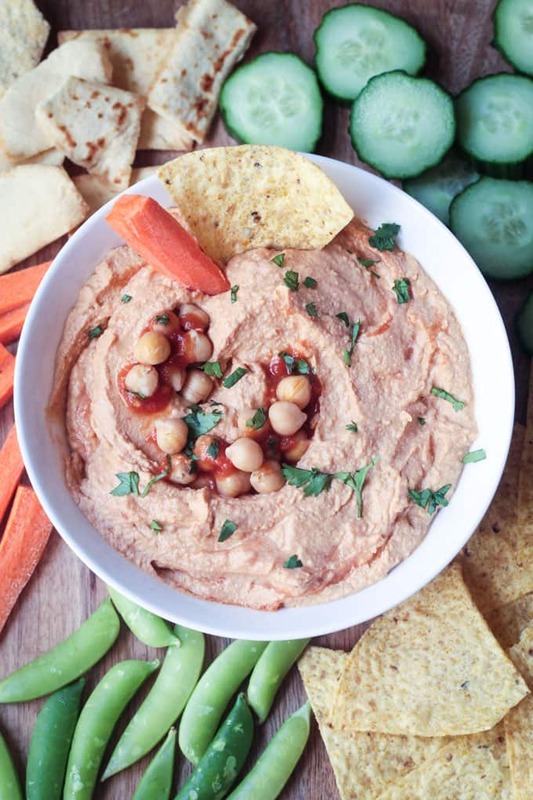 Smoked Almond Cheddar Spread – a vegan cheddar cheese spread that’s so simple to make. 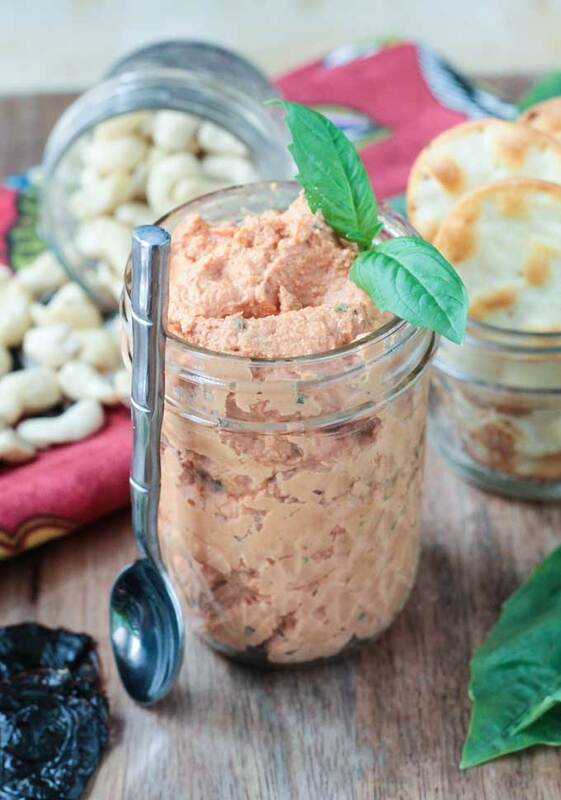 Just 5 ingredients and a food processor are needed to make this delicious smoky spread. Serve it with crackers, fresh pears, raw veggies, or on a sandwich. “I could never give up cheese!” Next to “But where do you get your protein?” its what I hear the most from people with reservations about a plant based diet. I totally understand. I used to be a dairy fiend myself – cheese on everything, cheese in everything, cheese as a snack, a huge glass of milk with meals, yogurt for breakfast, cheese with wine at the end of the night. Well, guess what? You can still have all that, but in a healthier way and without the saturated fat, cholesterol, indigestion, and inflammation. 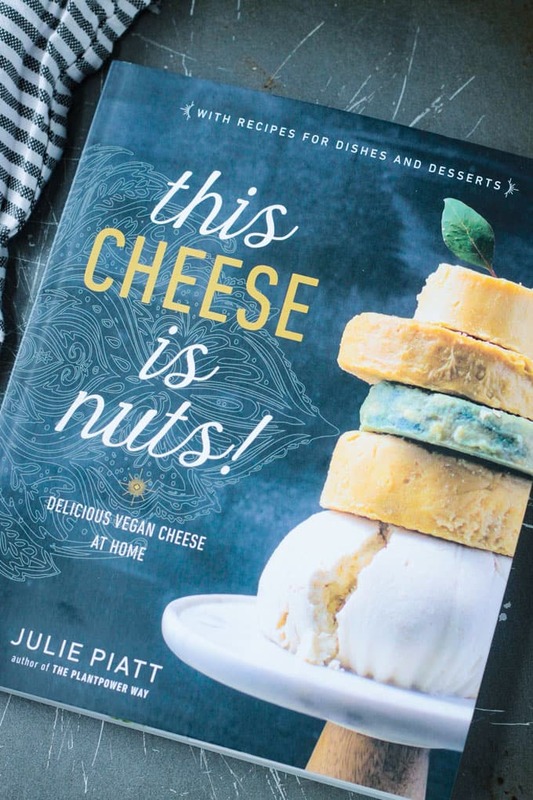 Julie Piatt’s new book, This Cheese is Nuts!, will show you how to create silky rich vegan cheeses at home that will impress even the most passionate cheese lovers. Make sure you read all the way to the bottom of the post for your chance to win your very own copy of Julie’s book. When I first made the decision to give up dairy, I was excited, but nervous. I knew I was doing the right thing for my body, but gosh, I really loved cheese. Thankfully, through the years, I’ve learned how to make my favorites dairy free so I don’t have to give up the flavor and textures that I loved so much growing up. We still enjoy Mac and Cheese, Broccoli Cheese Soup, Cream Cheese, Cheesecake, Ice Cream, Ranch Dressing, and even French Onion Dip and Queso! This book has so many cheeses that I would have never thought possible to recreate at home. I’m so excited to add all the wonderful recipes to my repertoire. You might know Julie from her other cookbook, The Plantpower Way, which she cowrote with her vegan endurance athlete husband, Rich Roll. From easy cheese sauces and quick form cheeses to aged cheeses and even desserts, This Cheese Is Nuts! has everything you are looking for to satisfy those rich cheese cravings. Julie also covers the essential equipment and pantry staples you’ll need to easily make this collection of cheeses anytime you wish. There are a few unique ingredients that you probably don’t currently have in your pantry, like agar-agar, acidophilus, and Irish moss. They show up repeatedly in many of the recipes, so know if you buy these ingredients they definitely won’t go to waste. 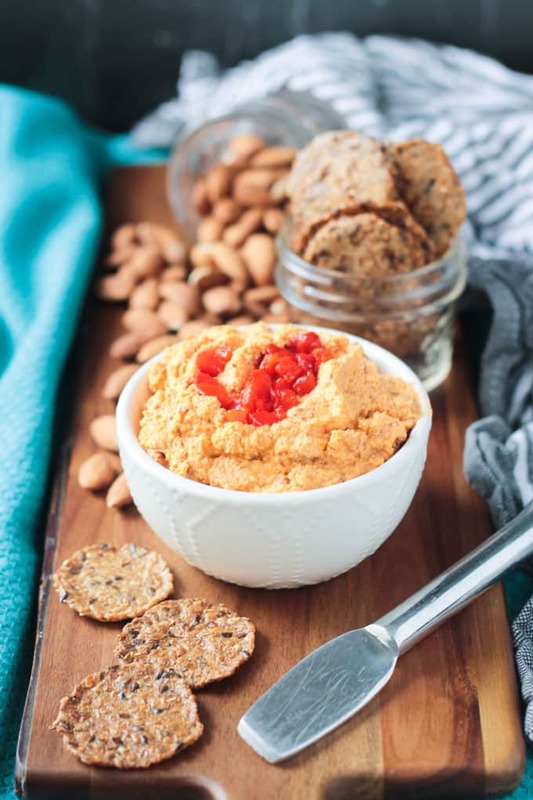 There are plenty of recipes in this book, however, that use your run of the mill pantry staples – like the vegan cheddar cheese spread I’m sharing below. I hope you love this vegan Smoked Almond Cheddar Spread as much as we do. If you try it, please come back and leave me a comment below with your feedback. You can also find me on social media. Be sure to tag @veggie_inspired and #veggieinspired so I’m sure to see it. Enjoy! And don’t forget to enter the giveaway below to win your very own copy of This Cheese is Nuts! by Julie Piatt! Good luck! 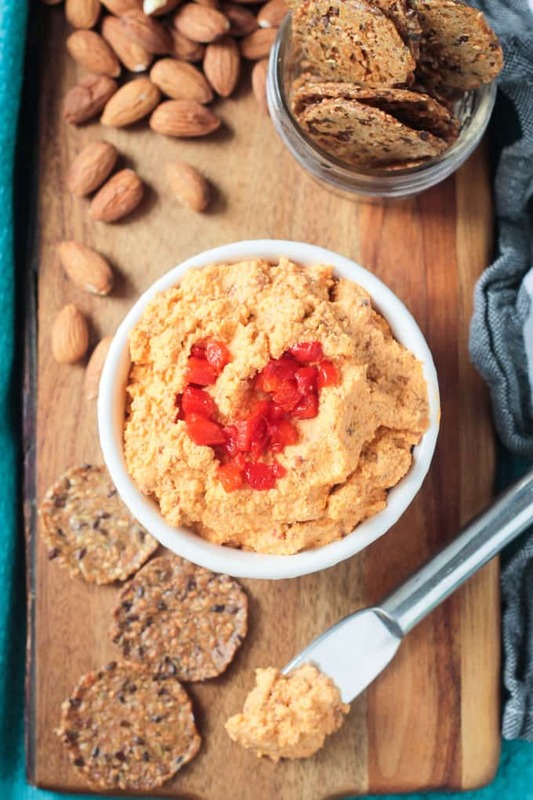 Smoked Almond Cheddar Spread - a vegan cheddar cheese spread that's so simple to make. 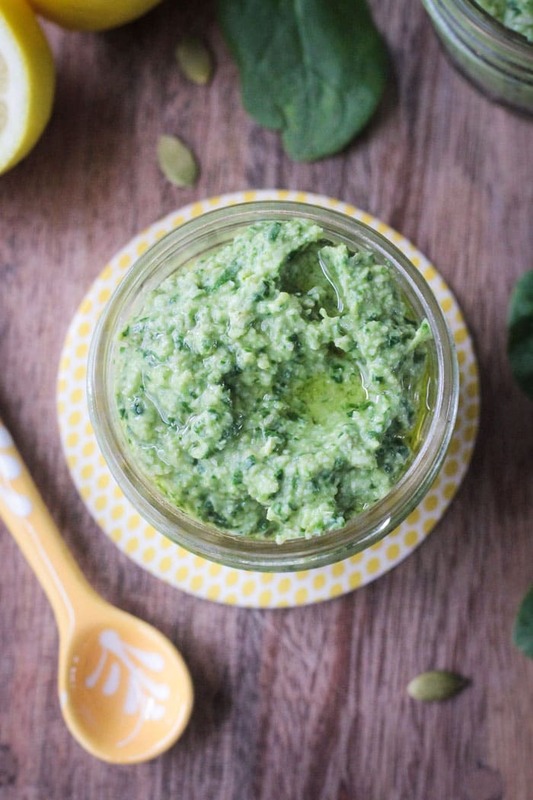 Just 5 ingredients and a food processor are needed to make this delicious smoky spread. Serve it with crackers, fresh pears, raw veggies, or on a sandwich. Drain the almonds. In the bowl of a food processor, lace the almonds, pimientos, nutritional yeast, salt, garlic powder, and 1/4 cup pimiento liquid. Process until the mixture is well incorporated. Remove the lid and test the cheese for texture and salt content. If you want a smoother spread, add more pimiento liquid in small increments and process again. Add more salt if needed. Serve with crackers and fresh pears. Alright guys, here it is – your chance to win your own copy of This Cheese Is Nuts! by Julie Piatt. If you want to assure yourself a copy, you can buy the book here. This smoked cheese looks amazing! But cheddar was always fave. So the sharp cheddar would probably be one I would have to try! I always loved cheddar too…the sharper the better! Good luck, Jenn! I would love to try the Ancho Chili Nacho Cheese! I would first try one of the quick “form” cheeses – maybe provolone. Great choice. Good luck, Vera! Do I have to choose???? I want to try them ALL!!! Thanks so much for the opportunity!!! Good luck to everyone!!!! Fingers crossed!!! No, no need to choose. Make them all!! 🙂 Good luck, Amy! It will work just as well! I hope you love it. Good luck! I am making this asap!!! Looks like a smooth cream cheese. This book looks great! There are so many excellent nut-based cheeses for sale nowadays, I find that I don’t make my own as often as I used to. However, these sound so inviting, I might have to start! I’m especially intrigued by the cashew brie. So true! On a whim I definitely buy them…but I cringe at the pricetag every time! I love pretty much anything with sun dried tomatoes. Cheese with it sounds amazing! Me too! They are so flavorful! Good luck, Julie! This recipe looks delicious and is really easy to make. I think it’s my next pot luck dinner item! Thanks for hosting the give away. Awesome! Sounds like a fun potluck dinner! 🙂 Good luck, Amy! I was soooo cheese obsessed before going vegan. When people say to me “I would never be able to give up cheese”, I kind of laugh because I used to have a drawer in my fridge of just cheese. I’m excited to try the Faux-Quefort – yum! Yes, me too!! I totally get it – it’s hard – but so worth it once you get over the addiction. Macadamia Nut Herbed Goat Cheese sounds lovely! This book sounds amazing!! I think I’d like to try the cashew brie and the gorgonzola, but this smoked almond cheddar sounds amazing!! I host thanksgiving every year, and, since going vegan, I’ve struggled to find alternatives to the usual cheese platter. I think I’ll have to make all three!! And what a beautiful cheese platter it will be! Good luck! I really miss a good smoked gouda so I am definitely intrigued! I hope you get to try it! Good luck! I would love to try an almond cheddar! I’m a cheese addict, but trying to cut back on my dairy intake. This sounds perfect! I want to try the Gorgonzola. Miss blue cheese. Me too! I used to love the stinky cheeses! This is a fun book! I love the mac and cheese recipe from it that I shared on my blog. No one has to give up the flavors they love! Agree!! And I love the mac and cheese too! Wow! This book looks amazing! I would probably start by trying the spreads and sauces, especially the ancho chile cheese spread but I’m also really interested in trying some of the nut-free cheeses. Like everyone else I love cheese and like Stacey’s daughter I have a TBI and am overweight. Consequently I need simple recipes, which is why I would start with the spreads and sauces, but I also know I need to be careful and save eating even plant-based cheeses for an occasional treat because nuts are pretty calorie dense. That said, I’m excited about the chance to give these recipes at try and plan to make the smoked almond cheddar cheese in the next few days. Thanks for the chance to win a cookbook! Hi, Michele! I’m excited to try the Nacho Cheese too! I agree that even plant based nut cheeses should be considered a treat because of the calories, but they definitely have many more nutritional benefits than dairy cheese does. Good luck! Is it possible to have too many cookbooks?? 🙂 You’d love it, Gwen! I’ve made this cheese spread, too, and it’s so good! It’s a really great book. Yes, I’m loving it so far. And we’ve been putting this Smoky Cheese Spread on everything! Cheddar would top my list followed by a feta. I am trying top greatly limit my dairy as it makes me mucousy. A lot of people have that problem with dairy. Hopefully, you’ll like these dairy free cheese just as much! It’s hard to choose what I’d be most excited to make – I love form cheeses because they slice and grate like cheese, but the taste of spreads and sauces usually end up being my favorite. The ancho chili nacho cheese sounds divine! Yes! Nacho cheese sauce is the best! This will be just what I need to get my daughter who is severely overweight and suffers from TBI to go vegan. Cheese is the one thing that has been impossible for her to give up! IF I can place great cheeses in front of her and assure her she can have cheese and eat it too, we may just be able to get healthy again! Thank you for the giveaway! Good luck, Stacie! Dairy is so addictive – I understand how it’s so hard to give up. I wish you all well! Hi, Stacie. Are you sure? You definitely don’t need fancy equipment or ingredients for all of the recipes. For sure, there are some that are more involved, take more time, and require things you may not already have in your kitchen. I think you would for sure enjoy the easier recipes. But it’s totally up to you! I understand. And thanks for the FB love! Muah! Sorry Jenn, this went to my spam. We tried the Smoked Almond Cheeder recipe above and she loved it! So yes, please re-enter. Anything will be better than nothing and she said after tasting “if this is vegan, I can do this” She is on disability and so could not buy the stuff, nor could I so I did not want to disappoint. The positive feedback gave me hope. She is at a dangerous weight and cannot go through surgery because of her physical and mental issues. So yes, please enter. Thank you for understanding and coming back to me! You are still the best! Nothing but sunshine for you Jenn! You got it! Happy to hear she liked it! That’s how I used to be too, Bobbi. The sharper or stinkier, the better. 🙂 Once you wean yourself off, you won’t miss it. But it does take some time to realize that! I’d really love to go vegan, but I travel a lot, and vegetarian is hard enough. However, at home, one of my obstacles to going vegan is my love of cheese–although I feel like this is a flimsy excuse. As such, I’d be most excited to try a cashew brie and sharp cheddar. I cannot wait to try this cheese dip…I don’t love smoke flavor that much, so I’ll probably just stick with regular salt. Do you think it will still taste good? Hi, Taylor. Traveling can definitely be tricky. I always check to make sure I have a mini fridge and microwave in the hotel room and bring along my own food. More often than not I use flavorful pestos, hummus, or creamy avocado to replace the richness and mouthfeel that I used to get from cheese. I don’t even miss it anymore and when I do take a bite of real cheese, it’s not like I remember…definitely not the love I used to have. But, it is so nice to have these dairy free cheese options for those times when you really want that cheese taste and texture. This recipe definitely won’t be as flavorful without the smoke. You’ll probably need to add more nutritional yeast and pimientos. Start with the recipe as written, but use regular salt. Then taste and adjust from there. A tbsp bit of miso or apple cider vinegar might be good too to give it a stronger flavor. Let me know how it works out! I don’t think I could ever give up cheese but I have had some lovely nut-based vegan cheeses that were just so flavorful that I wouldn’t mind having them every once in a while. That’s great Sandy. Glad you found some you liked it! The pictures here is more inviting that the originals . I am always looking for no diary options and will be giving this a try . Thank you for sharing ! Oh, thank you, Syama! I hope you love it! Oh my gosh! I love this cheese and I really want that cookbook. I didn’t even know that smoked sea salt existed. I’ve entered to win and love your blog. I didn’t either until this book! It was actually quite easy to find. BUT, you could totally use a few dashes of liquid smoke and regular salt too. Good luck! This book would be perfect for you, Erin! Good luck! I can’t believe this only requires a handful of ingredients. I just watched a documentary talking about all of the things you mentioned about plant based. What a great post! Thanks, Brandi! Which documentary did you watch? What the Health has been on my list and I hear that’s a really good one. I am excited to make a Brie style cheese! I hope you get a chance to try it! Good luck, Michelle! That’s on my list too!! Sounds so good! ALL the cheeses!! Thanks for the chance! HaHa! I’m with you! Good luck, Rusty! I’m most excited to try the cashew Brie. Thanks for stopping by, Piper! Good luck! I would love to try a new vegan feta! Thanks for the giveaway. Almonds are soaking as we speak! Thanks for the opportunity! WooHoo! Hope you love it! We’ve been eating it with everything! Good luck! Yes, yes, YES! I have honestly heard so much good stuff about Julie’s book, so I’m like super excited about this giveaway -thanks for the awesome opportunity, Jenn! You will love the book, Pia!! And you are right, most everything you see is nut based. The same is true for this book, but it’s definitely nice to have the nut free options as well. Good luck!